The Gryphon I GD4400 is at the top of its class of handheld scanners for general scanning purposes. Its omni-directional reading range allows it to capture all common 1D and 2D, as well as postal and stacked codes. According to its purpose choose between the variants with standard or HD resolution. The Datalogic Motionix technology reacts to all movement and the condition of the scanner, switching automatically between handheld or stand mode. Thanks to its built-in tiltable stand (depending on version), it can bend to your liking. The all-in-one imager can be used at any stand angle and for individual scanning needs. The practical and highly visible 4-dot aimer shows the precise reading zone. 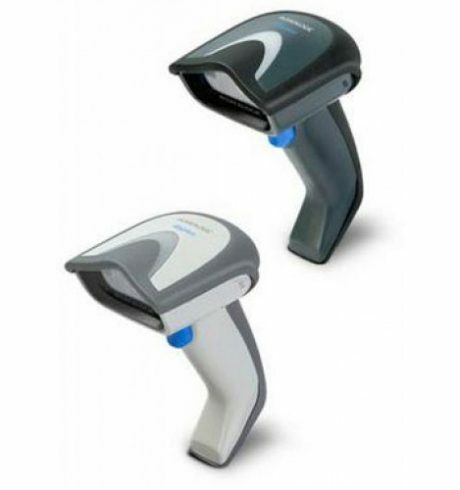 With its central target aimer, scan a clearly defined area from lists and other surroundings in which multiple barcodes are situated next to each other in cramped spaces. Its patented »Green Spot«, plus a noticeable beep, confirm the scan both visually and acoustically. This gives the user the security that each scan is performed successfully. Multiple scans and the resulting software mistakes are avoided, and the result is significantly increased efficiency. The comfortable dark red scanning light is easy on the user’s eyes, effectively preventing excessive tiredness. Its image capture ensures reliable document scanning, including signatures. You therefore do not need additional hardware, since the Gryphon GD4400 fulfills all these duties with excellent precision. The housing of the GD4400 is highly robust and withstands numerous falls without suffering damage, even from a height of 1.8 m. Even in an environment at 50°C the Gryphon is fully functional and delivers reliable performance. This flexibility also allows it to be used in applications for production and in light industry. For easy integration into existing environments you have multiple variants with multi-interface to choose from. Decide for an RS232, IBM and USB interface, or an RS232, USB and KBW interface.